Growth opportunities and unexpected challenges pop up when you’re running a business. So, when it comes to having access to extra funds, timing makes all the difference. We offer loans of $5,000 to $300,000 with funding possible in 24 hours*, and flexible, cash flow friendly repayments. Funds can be used for any business purpose, and no security is required to access up to $100,000. If your business has a turnover of more than $6,000 per month and can demonstrate 6 months of trading for a new business, or 3 months if you’ve purchased an existing business, we can help you. 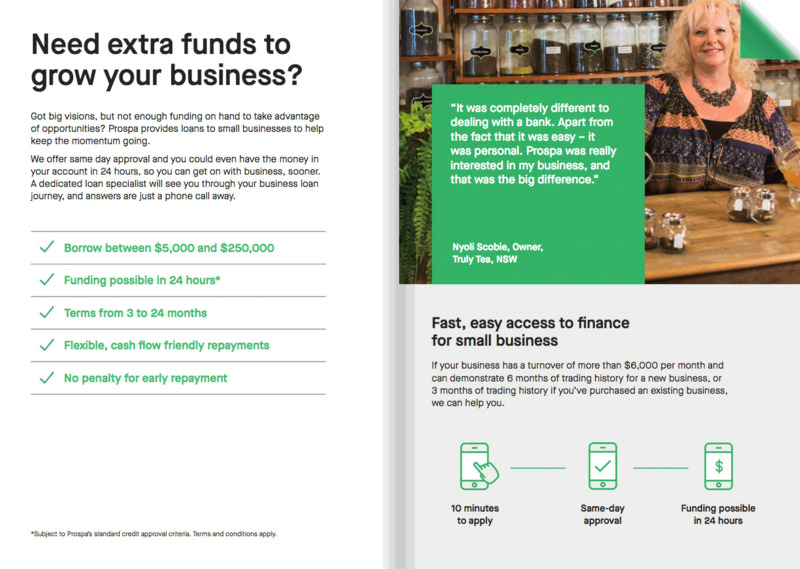 Download our eBook to find out why more small businesses are turning to alternative lenders like Prospa. Get started below, or call one of our friendly team today on 1800 989 682. We’re there to help. We use real-time business data to get you qualified in minutes. There is no obligation to proceed. TERMS AND CONDITIONS: Deferred payment offer is available for new and existing customers. For business loans settled between 11 November 2018 and 16 December 2018 inclusive, no loan repayments required from the loan settlement date to 6 January 2019 (inclusive); loan repayments begin on Monday 7 January 2019. Total loan repayment term will be extended by the period of time equal to your loan payment deferral; offers not available to partner loans on a partner red-hot offer rate; not valid in conjunction with any other offer; offer may be withdrawn without notice; standard approval criteria and terms and conditions apply. Standard credit assessment, fees, terms and conditions apply.